In December 2017, the Iraqi government declared victory over the ISIS armed group after 4 years of destructive conflict across the country. Today, it is time for reconstruction, not only of infrastructure and services but also of the social fabric, destroyed by a conflict that has torn the Iraqi society apart. Action Against Hunger is intervening in local communities, WHICH include displaced Iraqis and Syrian refugees, to help them face this crucial period. Following the Gulf War, the American occupation from 2003 to2011, the Iraqi civil war in2006-2007, and the admission of Syrian refugees, Iraq was already in a weak position and burdened by internal discord before the arrival of ISIS, which rapidly took large stretches of the country commencing in January 2014. Thirty years of conflict: a country to rebuild. Out of all the photos that have been taken, the most widely distributed in the media are those of the battle for Mosul, the capital of the governorate of Nineveh, in the north of Iraq. Months under siege-like conditions created a humanitarian crisis. Civilians were trapped or forced to flee to camps in the south of the city. Retaken last July, much of the town is in ruins, infrastructure is destroyed, there are few functioning healthcare services, there is a shortage of food and water, and many areas remain littered with explosives. Mosul personifies this conflict, but the countryside and rural towns have also paid a very high price. Last February, the Iraqi Government estimated that 88 billion dollars (71 billion euros) are needed for the reconstruction. In total, nearly 6 million people left their homes seeking refuge in neighbouring regions. Currently, 3.9 million have returned to their homes, but almost 2 million remain displaced, including in the camps or informal settlements. People across the country suffered during this period; thousands were displaced when ISIS initially took large swaths of territory in 2014, while others were displaced during the military operations to retake these areas. Some were forced to remain under ISIS control during this period with limited access to services and strict conditions placed upon daily life. Others lived in poorly served camps, while some squatted in unfinished buildings. Confidence and trust between different communities and groups, who experienced vastly different circumstances during this time, must be rebuilt. Today, it is time for reconstruction. All that is tangible – buildings, infrastructure, and services – as well as that which is less visible, a society where different communities and religions can live side by side. Over these last few months, life is starting to return to normal in Mosul and previously held regions, such as Sinjar; however, the crisis is still paramount. The idea that all of the displaced will return is practically impossible. In the short-term, from now until the end of 2018, only 30% of those remaining in displacement consider returning home for a multitude of reasons –destroyed houses, few employment possibilities, insecurity in their areas of origin, lack of basic services and a loss of savings. 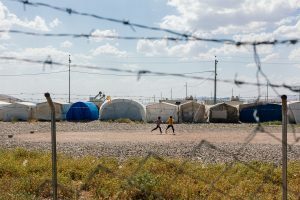 In parallel, the resources, services, and infrastructure in those areas, like Iraqi Kurdistan, which provided shelter to the majority of the displaced, are under a great deal of pressure. The semi-autonomous region of Kurdistan is currently accommodating nearly half a million people and is itself facing an economic and financial crisis that is affecting both the local population as well as the displaced Iraqis and Syrian refugees taken in. Once one of the most stable areas in the country, the conflict with ISIS, the drop in oil revenue, and the decrease in budget provided by the Iraqi Government to the region – including to pay the salaries of civil servants – has meant that the situation in Iraqi Kurdistan is now much more precarious.As a result, the poverty rate has doubled in 3 years and the salaries of the civil servants are no longer completely assured, which prevents the functioning of the public services. Action Against Hunger has been operating in Iraq since 2013 in response to the influx of the Syrian refugees. Since 2014 and the conflict with ISIS, our teams have been assisting displaced Iraqi people and the local communities who have taken them in. Today, we are helping refugees, the displaced populations, and host communities through water, sanitation and hygiene activities, nutrition programming, mental health and physiological support, as well as in food security and livelihoods activities. In Mosul, we have rehabilitated parts of the water network in the city and we have operational programmes in two camps for the displaced to the south, Hammam-Al-Ali 1 & 2, for pregnant and breast-feeding women and their infants suffering from undernutrition, as well as those who have suffered from trauma. In Iraqi Kurdistan, thanks to a training and employment creation programme for displaced Iraqis, Syrian refugees, and host communities, we are working on improving the conditions of youth, and in particular those of women who are at a greater disadvantage when accessing employment since they often support their family on their own. Shahla Nawaf QasimFemme, 19 ans, IDP, camp de Berseve 1 - salon de beauté et coiffureElle travaille dans un salon de beauté en dehors du camp, dans la ville de Zakho qui se trouve à une vingtaine de minutes. Shahla vient d’une famille nombreuse, le père a trois femmes. Ouvert d’esprit il a envoyé tous ses enfants et ses femmes à l’école. Shahla est la seule qui subvient aux besoins de la famille. L’équipe psychosociale a noté une transformation impressionnante en termes de confiance en soi entre le début de son apprentissage et maintenant. Trouver un moyen de transport fiable entre le camp et le salon en ville a été un grand défi surtout pour une fille. Elle a réussi à trouver un chauffeur de taxi qu’elle partage avec une autre fille. Elle a tatoué son nom sur ses mains. Noora RashoFemme, 32 ans, IDPs, camp de Berseve 1 – salon de beauté Son mari est malade, elle a eu des difficultés à le convaincre de la laisser rejoindre le programme. Elle évoque les changements bénéfiques que lui ont apportés les sessions de support mental : elle est plus détendue, elle a appris à gérer son passé. Ameera Syado Femme, 20 ans, IDP, camp de Chamisku – salon de beautéLes mains déformées par des brûlures. Elle avait 12 ans quand elle a essayé de s’immoler pour fuir un mari violent. Elle n’avait que quelques années de plus quand elle a fui, enceinte, à travers les montagnes du Sinjar où elle a vu les enfants mourir de faim et de soif et leurs dépouilles abandonnées par leurs familles sur le bord du chemin, car le temps manquait pour les rites funéraires. Durant l’interview filmée, elle montre des signes de stress, de confusion quand elle repart dans ses souvenirs. Mais après, on a pu la suivre visiter des amis avec sa fille, où elle est beaucoup plus apaisée. Elle gère un salon de beauté. Elle a beaucoup travaillé avec la psy pour surmonter sa crainte que ses clientes ne supportent pas ses mains. Our activities are backed by USAID (United States Agency for International Development), OCHA (UN Office for Coordination of Humanitarian Affairs), AFD (French Development Agency), DANIDA (Denmark’s Development Corporation), UNICEF (United Nations Children’s Fund), Centre de Crise et de Soutien, SDC (Swiss Development Cooperation), WFP (World Food Programme), and Action Against Hunger own funds.